Precious materials, refined details, and bespoke elements characterize the wide composition designed on model D90. 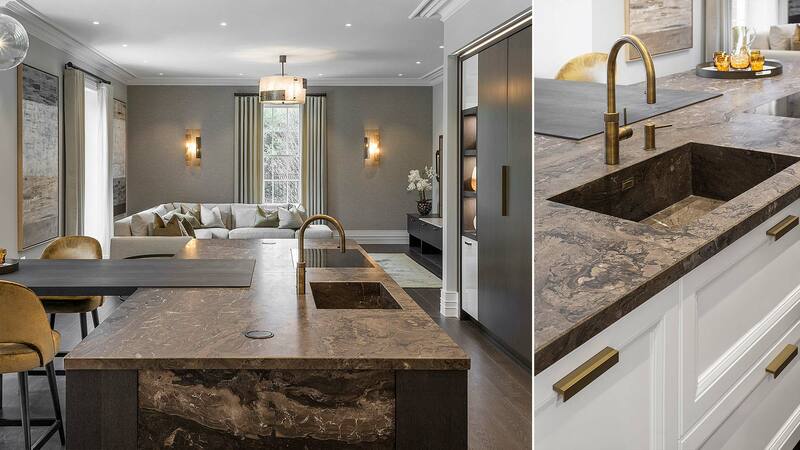 In Weybridge, near London, TM Italia has realized a sophisticated kitchen with island project that fits into the elegant open space, becoming a central point of domestic life. 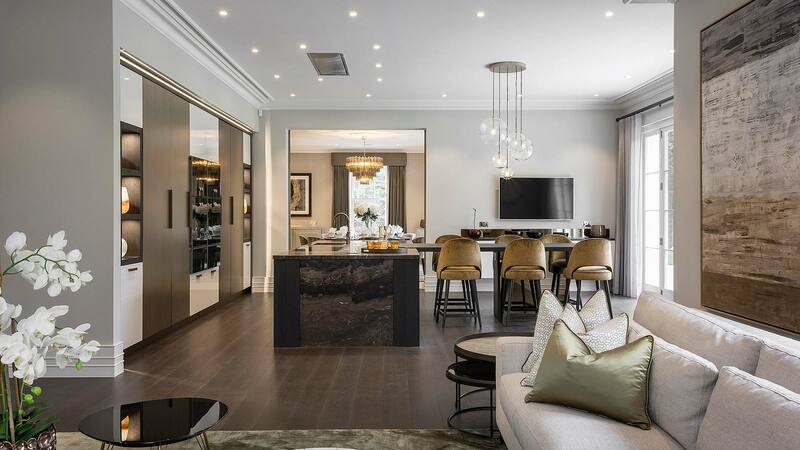 The linear composition of built-in columns is masterfully combined with a T-shaped island that includes a work block designed on D90 concept and a dining table in Rovere Grigio, with thickness of 6 cm, overhanging from the island. The TM Italia’s tailoring experience is evident in the skill of connection of the two different surfaces. 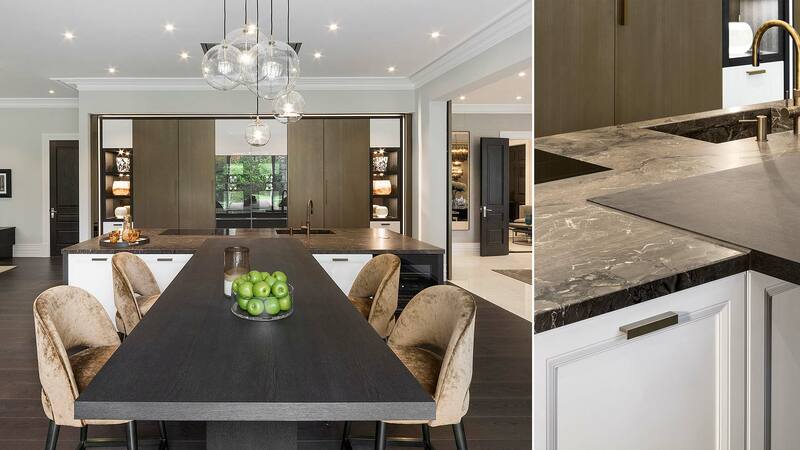 The Rovere Grigio of the table is inserted into the 4 cm Frappuccino stone worktop, creating a material contrast that differentiates the function of the two elements. The sophisticated selection of materials continues on all the bases of the island. 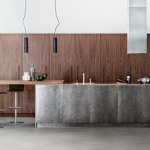 The side panels are made of veneered gray stained Rovere Rigantino oak wood and an intermediate panel in melamine Grigio seta finish covered with Frappuccino stone. Both side by side with special frame doors with sample profiling and handles Bronzo Laccato. The worktop embed the Frappuccino stone assembled sink and filotop induction hob. The columns – designed on model D90 – provide an alternation of open elements and closed spaces, that give a symmetrical rhythm to the linear wall. 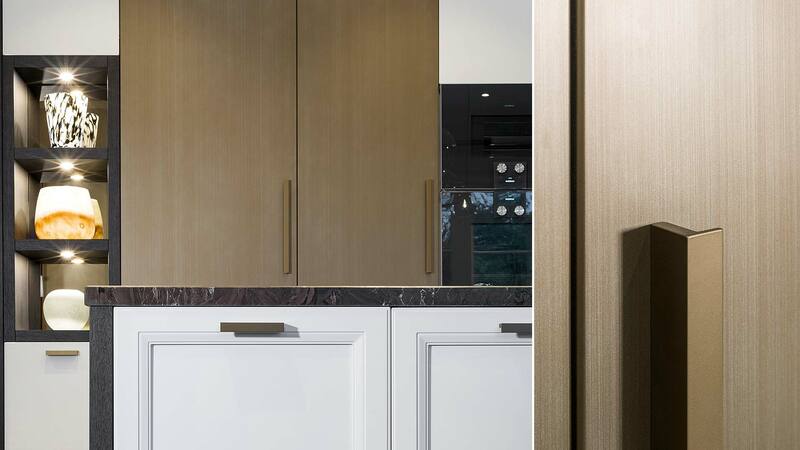 The choice of the columns finishes is in continuity with the materials of the kitchen island: Rigantino oak wood for the visible compartments, glossy finish Bianco puro for the push-pull doors and Bronzo Laccato finish for the full height doors and the handles outside. The columns are customized with LED strip lighting, side and interior, with spotlights that enhance the plans of the day columns . 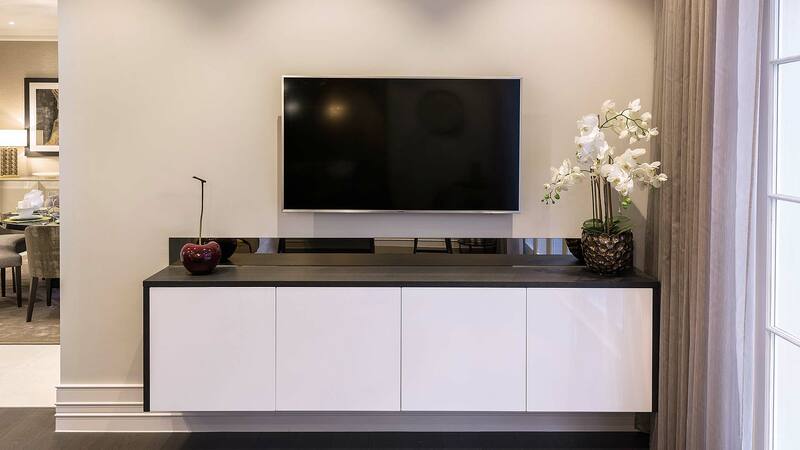 The project is completed by the suspended living cabinet in living area with 4 doors with Rovere grigio and Bianco puro Lucido finish and push&pull opening. 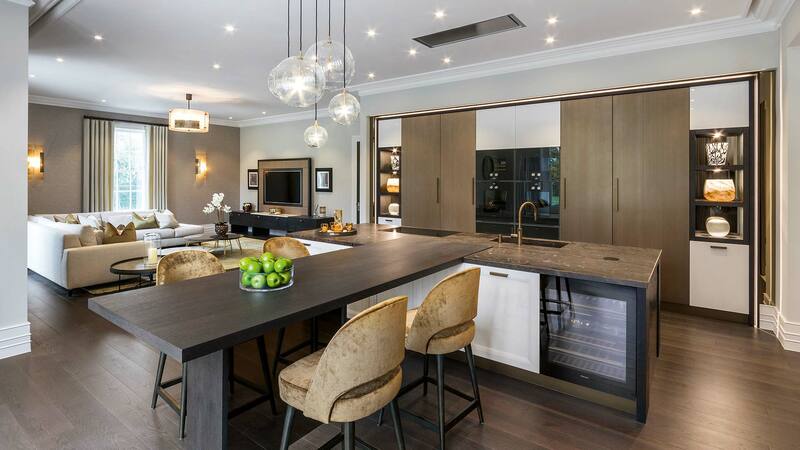 It’s inserted in the open space environment in stylistic continuity with the materials of the kitchen with island. The TM Italia’s kitchen with island is equipped with modern appliances: ovens, microwave oven, wine cellar and warming drawer. Extra equipment that enrich the open space and adapt it to the different needs of client.